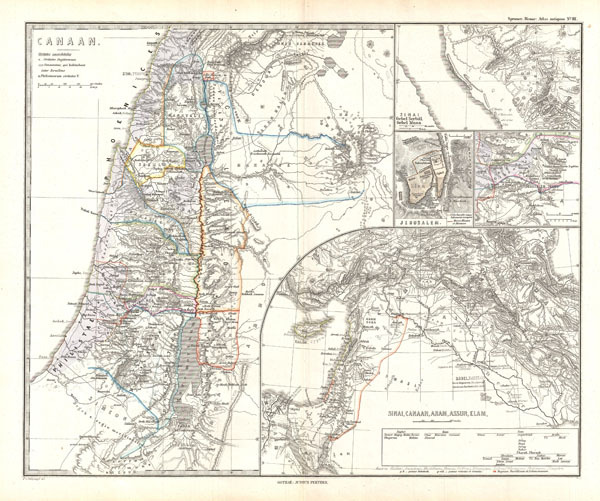 This is Karl von Spruner's 1865 map of Canaan, Israel, Palestine, or the Holy Land in antiquity. This detailed map focuses on the eastern Mediterranean coastline from Gaza to Sarepta and inland as far as the Dead Sea. Includes the modern day countries of Israel, Palestine, Jordan, Syria and Lebanon. Insets focus on the Sinai, Jerusalem, the vicinity of Jerusalem, and in the lower left, a more regional perspective extending as far east as the Caspian and the Persian Gulf. The map shows important cities, rivers, mountain ranges and other minor topographical detail with place names in both ancient and contemporary forms. Countries and territories are designated with colored borders and each map includes a key or legend. The whole is rendered in finely engraved detail exhibiting throughout the fine craftsmanship of the Perthes firm. Rumsey 1626.003. Phillips (atlases) 3288. Espenhorst, J., Petermann's Planet, p. 397-404. Espenhorst, J., Andree, Stieler, Meyer & Co., p. 148.